Trap Line is for fur trappers wanting to maintain records of their catches, sets, fur sales, complete trap inventory and trapping activities. Records of catches, set types, set locations, trap types, trap modifications, etc. can provide valuable information. Trap Line is for fur trappers wanting to maintain records of their catches, sets, fur sales, complete trap inventory and trapping activities. This is a "must have" for the serious fur trapper wanting to maintain detailed records of trapping activities. 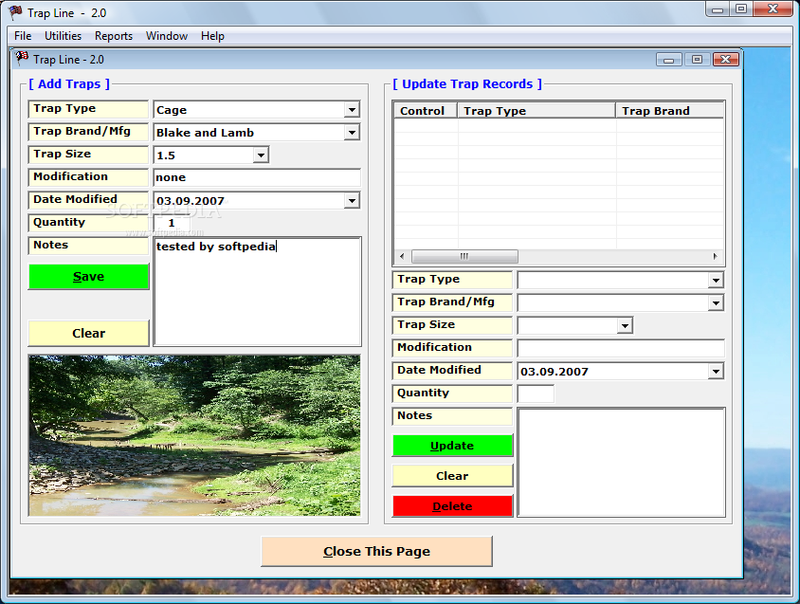 Unlimited records capacity allows trappers to maintain records for years to come. Records of catches, sets types, set locations, trap types, trap modifications, etc. can provide valuable information showing which sets and set locations are the most productive. Trap Line generates reports that can be printed and stored as hard copy backups with the click of your mouse. Also included in this release is the option to add the names and addresses, phone numbers, etc. of trapping partners, land owners, friends, State and Federal wildlife departments, etc. The straightforward data entry makes it easy to use and user friendly. Built-in help files provide detailed instructions on how to use any part of Trap Line. Trap Line is for fur trappers wanting to maintain records of their catches, sets, fur sales, complete trap inventory and trapping activities. This is a "must have" for the serious fur trapper wanting to maintain detailed records of trapping activities. Duffer's Log - The Duffer's Log 4.0 provides golfers a means to maintain an accurate history of their golf game. Numerous reports and datasheets can be used to analyze your game and determine the areas where you should concentrate more. The Game Bag - The database comes with a list of game animals and weapons however the user can add new game animals, new weapons, gauges for shotguns, calibers for rifles, etc. The Club Log - A application for small to medium size clubs (country clubs, leagues, teams, etc.) that is used to maintain a current database of all their members. The Fish Boat - The Fish Boat gives fishermen the means to keep a record of all their catches for all species, both freshwater and saltwater.